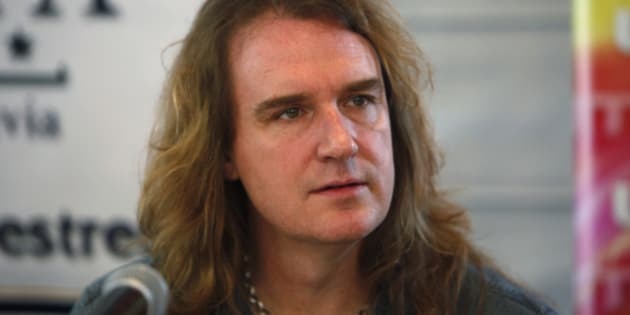 Always on the go and up to a new and interesting project, David Ellefson -- legendary bassist and co-founding member of Megadeth -- has made a huge success out of his talents during a lifetime of work in the music industry. This includes having the band's latest thrash metal masterpiece "Dystopia" skyrocket to the top of music charts, hitting first place spots on Billboard with #1 Rock Album and #1 Hard Rock Album, while reigning triumphant at the very top of Canadian album sales. As the applause continues to roar worldwide, I reached out to Ellefson to send my congratulations on the album, hear more about his recent Lemmy tribute show in L.A., and catch some inside news on his latest projects as Megadeth embarks on a worldwide tour in a few days. Fans and critics alike are posting fervent commentary on Dystopia being a thrash metal masterpiece -- the meeting point where innovation meets a classic Megadeth feel. As the band's highest charted album in 24 years, such success takes dedication and drive, and as readers know, I am all ears when it comes to success stories. "[Dystopia is] one of several albums we recorded in Nashville, fans are claiming this to be one of our strongest albums since 'Cryptic Writings', which we also recorded in Nashville", said Ellefson. With a 30+ year career and 15 albums deep, it must be exhilarating to know your band just cranked out one of its best records of all time. These much-needed positive vibes brighten up the rock scene after being hit by recent sad news -- Lemmy's passing -- bringing forth the end of the Motörhead chapter. A huge hit to the rock scene did not mean however that the party at the Whisky A Go Go would stop -- in true spirit of the late rock star. Supergroup Metal Allegiance, consisting of Ellefson; Troy Sanders (vocalist of Mastodon); and Corey Taylor (Slipknot/Stone Sour), was placed in the most honourable position to give tribute in remembering Lemmy. "Lemmy was the godfather to all things Thrash Metal. Without him our genre wouldn't exist. As a teenager I remember playing 'Ace of Spades' and 'Love Me Like A Reptile' at high school dances and people would look at us like we were insane. That's the power of a Motörhead song!". "Motörhead was probably Megadeth's first international show in November 1985 at the Santa Monica Civic Center and we launched Metal Allegiance on the maiden voyage of Motörhead's 'Motorboat Cruise' just last year. We were honoured to rally the guys to perform at The Whiskey A Go Go during his memorial on the Sunset Strip back in January. He gave us all so much, it was heartfelt to give something back to him... and very loud at that!" With a bit of time off from touring with Megadeth, Ellefson grabbed the opportunity to record the debut Metal Allegiance album, while at the same time managing all-female teenage punk group Doll Skin. Having recently completed a west coast tour alongside Metal Allegiance, this up-and-coming group fresh out of Phoenix, AZ is making waves with an innovative spin on original punk roots. All in a day's work right? Well that isn't all, Ellefson has also formed EMP Label Group, which recently produced and released Doll Skin's debut EP "In Your Face". Starting February 20th -- and with dates running through mid-summer -- Megadeth's headlining DystopiaTour will be thrashing through Canada in March. "The album debuted at #2 and shows the strength of our Canadian fan base! Canada is one of our strongest touring markets and the fans have been there with us since the beginning. We've played everything from seedy brothels on 'Peace Sells', to the largest hockey arenas, which says everything great about the Canadian fans."